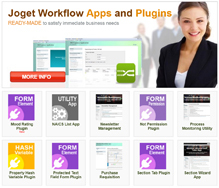 Joget Workflow is an commercial open source platform to easily build enterprise level process-driven web apps. The Community Edition is fully open source and free to use, distribute or modify according to the GPL license. Do I need to be a software developer to use Joget Workflow? No. To design, run and monitor typical business processes, you do not need to understand or write code. However, you do need to be comfortable with computers and internet technology in general. Software development would be required when developing plugins to extend the system or if complex integration is required. The open source version of Joget Workflow is under which open source license? Is Joget Workflow really FREE? How to install Joget Workflow for Windows? Download the Setup Wizard EXE or one of the Windows ZIP bundles. More detailed instructions are in the Joget Workflow Getting Started Guide. How to install Joget Workflow for Linux? Download the Linux tar.gz bundle. Extract the bundle and follow the instructions in the README.txt file. What are the tools and technologies used in Joget Workflow? Joget Workflow is built on various open source, open standard tools and technologies like Java, Spring, Hibernate, Maven, etc. Details can be found in the Technology page. Does Joget Workflow support plugins? There’s a plugin architecture that allows for functionality to be added dynamically. Using OSGI technology (a dynamic module system for Java), plugins can be added, updated and removed from the system in a plug-and-play manner. How can I develop plugins for Joget Workflow? Firstly, you’ll need to setup the Joget Workflow project source code and familiarize yourself with the technologies used especially Java and Maven. A plugin development guide will be made available in future. In the meantime you can refer to the source codes for the existing plugins in the project. How to integrate with Joget Workflow? Where is the Joget Workflow Open Source project community hosted at? The main community site is now at community.joget.org. The open source project forge is hosted at SourceForge at http://sourceforge.net/projects/jogetworkflow. How do I participate in Joget Workflow Open Source project? Where can I ask questions about Joget Workflow? You can use the Forums at community.joget.org to ask relevant questions about the project. Where can I report a bug for Joget Workflow? You can use the Forums at community.joget.org to discuss any issues. Where can I make a feature request for Joget Workflow? Shifting from a paper form of Job Order system to a paperless system has been seamless with Joget.